SON solutions can be divided into three categories: Self-Configuration, Self-Optimisation and Self-Healing. The SON architecture can be a centralized, distributed or a hybrid solution. This is the dynamic plug-and-play configuration of newly deployed eNBs. The eNB will by itself configure the Physical Cell Identity, transmission frequency and power, leading to faster cell planning and rollout. The interfaces S1 and X2 are dynamically configured, as well as the IP address and connection to IP backhaul. To reduce manual work ANR (Automatic neighbour relations) is used. ANR configures the neighbouring list in newly deployed eNBs and is optimizing the list configuration during operation. Dynamic configuration includes the configuration of the Layer 1 identifier, Physical cell identity (PCI) and Cell global ID (CGID). There are 504 different PCIs available in LTE, the PCI mapping shall fulfill the collision free condition as well as the confusion free. The PCI can be assigned either in a centralized or distributed way. When centralised assignment is used the OAM system will have a complete knowledge and control of the PCIs. When the distributed solution is used the OAM system assigns a list of possible PCIs to the newly deployed eNB, but the adoption of the PCI is in control of the eNB. The newly deployed eNB will request a report, sent either by User Equipment (UEs) over the air interface or by other eNBs over the X2 interface, including already in-use PCIs, see figure 1. - The eNB will randomly select its PCI from the remaining values. ANR is used to minimize the work required for configuration in newly deployed eNBs as well as to optimize configuration during operation. Correct and up-to-date neighbouring lists will increase the number of successful handovers and minimize the number of dropped calls. Before a handover can be executed the source eNB requires the neighbouring information: PCI and CGID of the target eNB. The PCI is included in every normal measurement report. The mapping between the PCI and CGID parameters can be done by using information from the OAM or reported by UEs decoding the target cell CGID on the broadcast channel in the target cell, see figure 2. The capability of decoding CGID is an optional UE feature. A network operator can put a cell on a ANR black list, to block certain handover candidates, for example from indoor to outdoor cells. 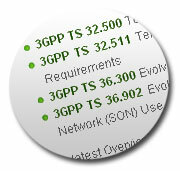 3GPP has also specified LTE Inter-Frequency and Inter-RAT (Radio Access Technology) ANR. The functions described above are mainly included in Release 8. Functions for self-optimisation are mainly included in Release 9. It includes optimisation of coverage, capacity, handover and interference. Mobility load balancing (MLB) is a function where cells suffering congestion can transfer load to other cells, which have spare resources. MLB includes load reporting between eNBs to exchange information about load level and available capacity. The periodicity of the reporting can be requested in the range of 1 to 10 s. The report can contain, hardware load, S1 transport network load and Radio resource status. The Radio resource status reports are separated in Up Link and Down Link reports, including the total allocation guaranteed and non-guaranteed bit rate traffic, the percentage of allocated Physical Resource Block (PRB) and the percentage of PRBs available for load balancing. MLB can also be used between different Radio Technologies. In case of inter-RAT the load reporting RAN Information Management (RIM) protocol will be used to transfer the information via the core between the base stations of different radio technologies. A cell capacity class value, set by the OAM-system, will be used to compare and weigh the different technologies radio capacities against each other. A handover due to load balancing is carried out as a regular handover, but it may be necessary to amend parameters so that the User Equipment (UE) does not return to the congested cell. The amendment must take place in both cells, so that the handover settings remain coherent in both. The eNBs need to estimate how much the cell border needs to be shifted, expressed in dB, to avoid a quick return of the UE. Mobility robustness optimization (MRO) is a solution for automatic detection and correction of errors in the mobility configuration. In Release 9 the focus is on errors causing Radio link failure (RLF) due to too late or early handover, or handover to an incorrect cell. In case of late handover, see figure 3, the handover procedure in the source cell is initialized too late, since the UE is moving faster than the Handover (HO) parameter settings allow. Hence when the RRC HO command from the serving cell is transmitted the signal strength is too weak to reach the UE, now located in the target cell, connection is lost. The UE attempts a connection re-establishment, containing PCID and C-RNTI belonging to the source cell, but received by the target cell. The target eNB will then inform the source cell about RLF to adjust Handover parameters. It is a bit more complicated to detect a too early handover, see figure 4. The UE has successfully been handed over from source cell A to target cell B, but since it was triggered too early the connection will drop almost immediately due to too poor radio conditions in the target cell B. The UE will then try to re-establish the connection, which will now take place in the original source cell, cell A, since this cell is the strongest one. The UE will use the PCID and RNTI from the target cell B and the source cell A will then consider this as a Radio Link Failure due to too late handover and send an indication to the target cell B. But the target cell B will now recognize the parameters in the indication, as given to a mobile that had just completed a handover to cell B from cell A now indicating failure. The target cell B will send back a report about too early Handover to adjust Handover parameters, to the source cell A. In order to save energy some cells can be switched off when capacity is not needed. The power consumption in a base station is not only related to load, a number of functions requires power even if there are no users to serve. But, if a cell is switched off, in the legal operator license there are still requirements on coverage, the coverage must be maintained at all times! The suspension of the cell may occur when the last user leaves the cell, all incoming handovers during this period of time will then be rejected. The cells that remain on, providing coverage, can wake up a suspended cell when traffic load increase. This can be done with a wake-up call to the sleeping cell. RACH optimisation aims to minimise the number of attempts on the RACH channel, causing interference. The UE can be polled by the eNB for RACH statistics after connection. The number of preambles sent until successful RACH completion, and the number of contention resolution failure are in the statistics. But PRACH configuration parameters can also be distributed amongst eNBs, like zero correlation configuration, root sequence, high speed flag and PRACH frequency offset. Features for automatic detection and removal of failures and automatic adjustment of parameters are mainly specified in Release 10. Coverage and Capacity Optimization enables automatic correction of capacity problems depending on slowly changing environment, like seasonal variations. Minimization of drive tests (MDT), is enabling normal UEs to provide the same type of information as those collected in drive test. A great advantage is that UEs can retrieve and report parameters from indoor environments.